Transforming the way care is delivered to patients. According to the Centers for Disease Control and Prevention, heart disease is responsible for the deaths of 610,000 Americans annually — or one out of every four deaths. Heart disease alone costs the United States $207 billion each year. This total includes the cost of health care services, medications and lost productivity. Geography matters — heart disease has its highest incidence in the southern United States. Exponential growth in the number of complex cardiac cases led UF Health to this most ambitious initiative to date in our commitment to serving patients throughout north central Florida and the state, the Southeast and beyond. The UF Health Heart & Vascular Hospital is an exceptional facility that matches the world-class care already provided to UF Health heart, thoracic and vascular patients. It supports the future of surgery with minimally invasive approaches, encourages collaboration among cardiologists and cardiovascular, thoracic and vascular surgeons, and provides patients and their families with a calm and comfortable space for healing. Learn more about the hospital and check out our 360 degree video. Learn more about heart, thoracic and vascular services offered at UF Health. The white-on-white glass structure, located behind the concierge desk in the lobby of the UF Health Heart & Vascular and UF Health Neuromedicine hospitals, will be updated from Jan. 2 to March 15. A new LED matrix will be installed replacing the current lighting system. 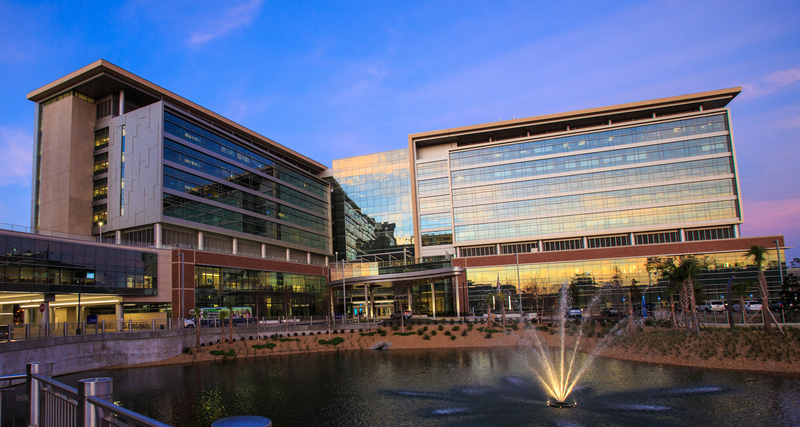 The UF Health Heart & Vascular Hospital and UF Health Neuromedicine Hospital officially opened on Dec. 10. Learn more about the big day. See photos of the construction for the UF Health Heart & Vascular and Neuromedicine hospitals. Learn more about UF Health’s new specialty hospitals that will provide an advanced home for the care of patients with complex neurologic, neurosurgical, heart and vascular conditions. A massive new generator will provide uninterrupted electrical power to facilities on UF Health's south campus. UF Health leaders and staff are readying teams and implementing meticulous plans as they prepare to occupy the UF Health Heart & Vascular Hospital and UF Health Neuromedicine Hospital by December 2017. Faculty and staff gathered to celebrate a momentous occasion in the construction of the new heart and vascular and neuromedicine hospitals. UF Health's new heart and vascular and neuromedicine hospitals are taking shape on Archer Road just east of the UF Health Shands Cancer Hospital. Vehicle access to the UF Health Shands Cancer Hospital and UF Health Shands E.R. via the Southwest 13th Street will be closed Dec. 19-Feb. 10. Providing employees a safe work environment is of the utmost importance to us. Please keep these behaviors in mind while driving and parking in the south campus garage. University of Florida Health broke ground today for the UF Health Heart & Vascular Hospital and the UF Health Neuromedicine Hospital, a project that will give rise to the Southeast’s most advanced home for the care of patients with heart, vascular and neurological illnesses. UF Health and Skanska USA will take several steps to ensure the safety and wellness of UF Health patients and staff, and of the crew members working on site. We’re growing. The future is bright for continued growth. But we’re out of space. So … we’re building a new hospital. Actually, two hospitals – one for heart & vascular care and one for neuromedicine – connected to each other and to the Cancer Hospital. Artists' renderings of the new Neuromedicine and Cardiovascular Specialty Hospital. The UF Health Shands board approved funding for the construction of a new specialty hospital that will house towers for neuromedicine and cardiovascular services.